Before I get started I have a little disclaimer. I am from Florida. We have lots of pools there. I, myself, have never lived in a house with a pool. I have been in my fair share of pools, but I have never had to deal with one. Pool ownership is not for the faint of heart, weak of knees, or poor of budget. Let me assure you of that last one. Owning a pool is for rich people. My pool has a liner. It is a “built-in” pool that is, indeed, underground and LOOKS like pools in Florida, but this is Georgia and most pools that are “built-In” or in the ground have liners. I thought that liners only applied to above ground-pools. How was I to know? So, when I became the owner of this fine pool, it was covered with 2X2 boards, a thick heavy plastic tarp thing, and a thicker than “chicken wire” kind of fencing nailed to the 2X2 boards. Remember? I purchased a HUD repo. They have their “rules and regulations,” and one of those is to drain the pool, and then put this safety feature over it in order to prevent injuries, deaths, or squatter-swimming. Because I was so busy with the inside of the house, I failed to recognize the need to do “something” with the pool. How was I to know that there was even a liner out there? Nobody told me. I didn’t look; it was covered! I became the owner in February and that is not a time to be occupied with a pool in Georgia. Unless maybe if it is an indoor pool, and mine is not. So, after a few months, I went outside to poke around the pool and see what was going on. The plastic thingee had dry-rotted and the pool had filled up with rain water. eeehhhhhwwww. I thought there was a drought going on here? It had wild life in it – frogs, toads, and other assorted creatures that are strictly indigenous to the Georgia swamps. I hired a co-worker who had a pool to pull the HUD cover off and scoop out the debris. We had no idea how much gunk was in that pool. He scooped and scooped, and never did get it all out. We thought we could save the liner. HA! No way. Phase 2 – The rain-filled green swamp. What drought? One night my daughter and I returned from an outing. It was dark. Way dark. I had left my bedroom windows open. The pool is located right outside my bedroom. Bellowing from my room was the mating call, or perhaps battle call, of some wild beast. It sounded massive, and like it probably had a multitude of razor-sharp teeth. It was lurking in my room waiting to rip me to shreds with those powerfully sharp teeth and pit-bull dog jaws that would render me unable to move while my flesh was being consumed. We stood by the door listening to its call. Daughter begged me to call the next door neighbor over and let the man go into battle. This was my home and I meant to protect my territory. I opened the door, and the creature’s bellows were deafening. “Don’t go in there,” begged Daughter. I will do what I must, assuring her that I could handle whatever it was. I stood in the doorway with my stun gun. I thought I would come face to face with a monster, or worse maybe an alien. I saw nothing. The bellows stopped. “It’s a trick,” screamed Daughter. It’s going to eat us. I visually searched the room standing in the safety of the doorway. Nothing. The mating calls, battle cries, whatever they were ceased. We were operating on raw nerves. What was that and where had it gone? Just when we thought it was safe to go in my bedroom, the bellowing began again, but this time we realized it was coming from outside, not my bedroom. The open windows allowed the mating/battle calls to reverberate into my room. Ever so carefully, we tiptoed through the room as if the mere pressure of our feet on the carpet would awaken the awful beast. We knew it was outside, but how easily might it get inside if that’s where it wanted to be? Realizing the awful noise was coming from the pool, we peered out the window. Of course there was nothing to see. It was dark and the water in the pool was a nasty, horrid blackish-green. I whipped out my cell phone and recorded the sounds the creature echoed into my house. I would take it to school the following morning and have an expert, real-live Georgia native listen to it, and hopefully find out what it was. The following day I did exactly that. I played the recording for a small group of my students. The results were comical. “Ms. P. – you have bullfrogs in your pool! How awesome!” Then came the most unexpected response to the whole situation. These fine young Georgia natives wanted to come to my house, get IN the pool and “gig” the frogs. “You want to actually get into my pool?” I asked incredulously, partly from repulsion to the thought of getting in that nasty water, and partly from disbelief that anyone would actually get in that water. I immediately called several pool companies to get estimates on fixing the pool. The average was $5000. Yes, that is correct. $5000. I didn’t have $5000 to throw in the hole in my back yard, so the pool went to the back burner. Then I started having nightmares that people were trapped in my pool, but could not be saved because of the color of the water and the gunk in the pool. So, I did the next best thing. I had a cover installed. It was much cheaper at $1500. It’s the kind of cover that you see in the advertisements with an out of control car careening through someone’s yard, coming to a stop on the pool cover. I felt safe, at least. The following spring, I had saved enough money to dish out the $5000 to fix the pool. Before I could call the pool company, the air conditioner went out. Totally out. If you have ever been to Georgia in the summer, you know that air conditioning is not a luxury; it is a requirement. So there went the pool. The following year (this past spring), I once again managed to save the money. I called the pool boys and they answered the call. The pool is a beautiful thing. Again, if you have ever been to Georgia in the summertime, you will recognize a pool as a necessary luxury! Phase 3 – Green water gone; nasty liner next. Note – the liner is supposed to be blue! Phase 4 – It’s already beautiful (well comparatively speaking). I actually became accustomed to the years spent listening to the Georgia swamp music as it wafted from my pool and into my windows lulling me to sleep every night. It was like the night music heard while out in the woods camping. I truly enjoyed it. Sad to report, but the fixing of the pool drove off the creatures to other nearby swamps and dirty pools. 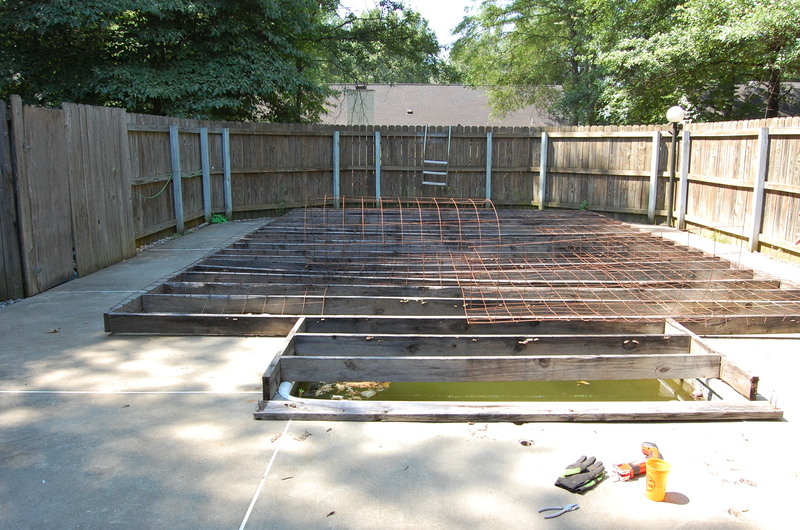 Phase 5 – Fresh water ready for the salt – they only system to have for your pool. Final Phase – Ahhh! A beautiful, clean pool. Next we beautify the fence. For now, we swim.